Author(s): Ning Liu, Yuan-Jie Shu, Bo-Zhou Wang, Xiang-Zhi Li, Fu-Qiang Bi. Xi’an Modern Chemistry Research Institute, Xi’an, Shanxi 710065, People’s Republic of China. Nitrogen heterocyclic N-oxides attract enormous interest in synthetic chemistry, medicinal chemistry, functional materials and energetic materials. Cyclization reaction turns out to be an important and highly rewarding protocol for the construction of N-heterocyclic N-oxides and different types of organonitrogen compound could be utilized as crude materials. In this work a review of recent advancement in the generation of pyrazole, imidazole, triazole, triazine, tetrazine, isoquinoline and other N-heterocyclic N-oxides and their derivatives via cyclization reactions is presented. Keywords: Nitrogen heterocyclic N-oxides, cyclization, mechanism, synthesis. Affiliation:Xi’an Modern Chemistry Research Institute, Xi’an, Shanxi 710065, People’s Republic of China. Keywords:Nitrogen heterocyclic N-oxides, cyclization, mechanism, synthesis. Abstract:Nitrogen heterocyclic N-oxides attract enormous interest in synthetic chemistry, medicinal chemistry, functional materials and energetic materials. Cyclization reaction turns out to be an important and highly rewarding protocol for the construction of N-heterocyclic N-oxides and different types of organonitrogen compound could be utilized as crude materials. 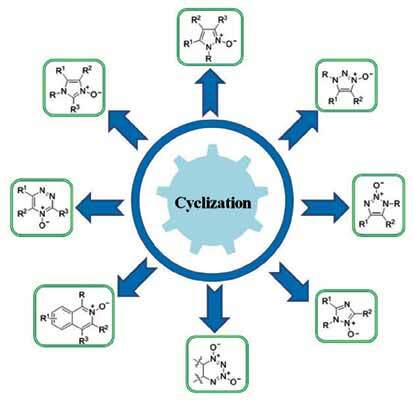 In this work a review of recent advancement in the generation of pyrazole, imidazole, triazole, triazine, tetrazine, isoquinoline and other N-heterocyclic N-oxides and their derivatives via cyclization reactions is presented.